this beautiful salad tagged along with the strawberry almond breakfast cake to my Pepe's fathers day celebration and was a bit of a scene stealer. 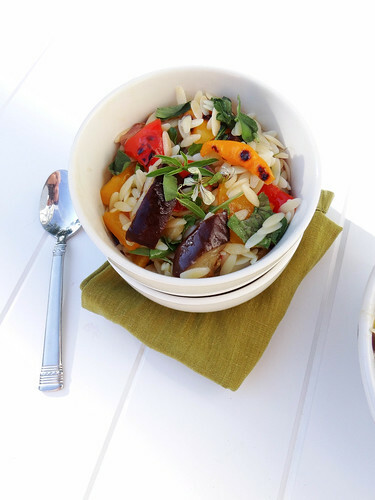 grilled eggplant, red onion and rainbow peppers are tossed with a healthy amount of fresh herbs, arugula and a double dose of lemon and olive oil then finished with a good flaky salt which intensifies the simple flavors. Eggplant is an excellent source of digestion-supportive dietary fiber and bone-building manganese. It is very good source of enzyme-catalyzing molybdenum and heart-healthy potassium. 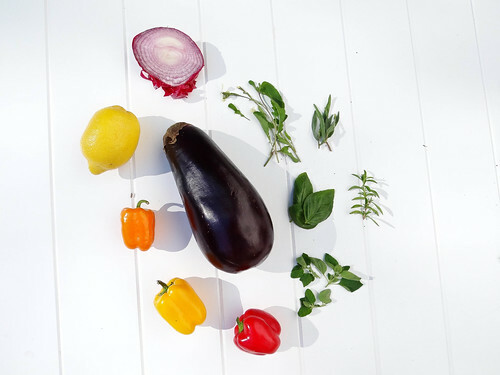 Eggplant is also a good source of bone-building vitamin K and magnesium as well as heart-healthy copper, vitamin C, vitamin B6, folate, and niacin. Eggplant also contains phytonutrients such as nasunin and chlorogenic acid. 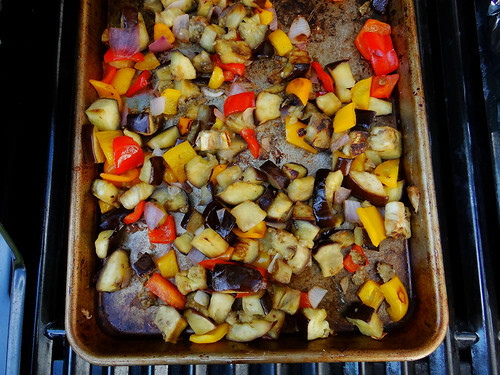 peppers, eggplant and red onion are easily grilled outside or roasted inside. but why heat up the house if you can grill in your own backyard. 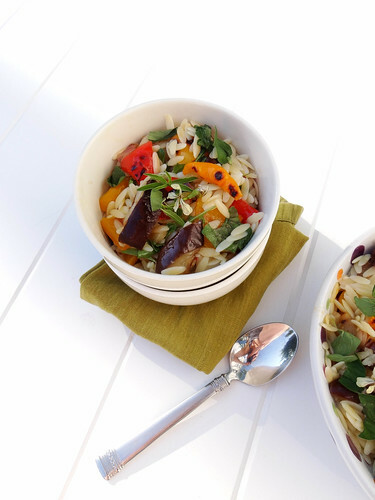 orzo - for the record is my favorite little past, i just love the little rice shaped pasta tossed with veggies and lightly dressed with a homemade vinaigrette. 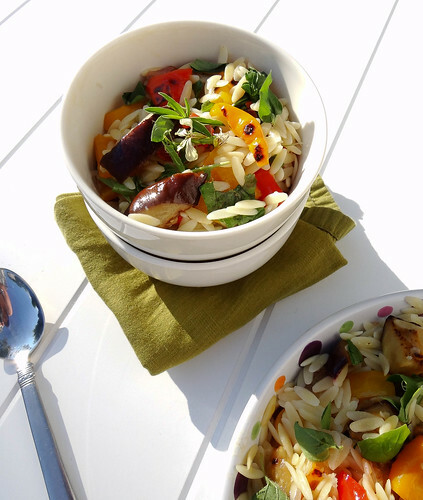 the grilled veggies are tossed with orzo then doused with a ton of fresh lemon juice and olive oil. herbs are a fairly new addition to the garden. in the past i have grown basil and parsley, herbs are so easy to grow so i expanded my herb garden to include winter savory ( a perennial), tarragon, rosemary, chives, 4 varieties of basil, parsley, thyme & oregano. maldon sea salt, or any other good flaky salt is generously sprinkled throughout the salad making all the flavors really "pop" in this dish. 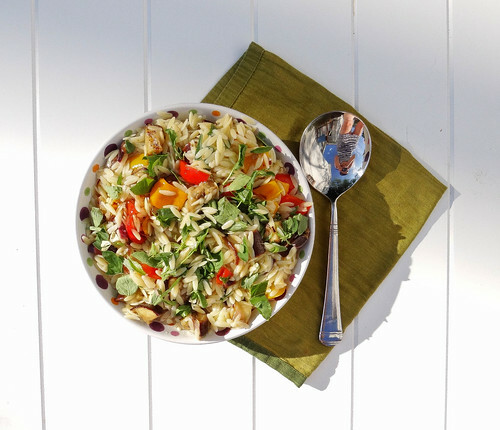 this most certainly has been my "go to" salad for BBQ's and backyard dinners. even better when made a day ahead, allowing the flavors to meld and intensify. i found that i needed to add a touch more olive oil prior to serving/removing from the fridge when made the day before, the extra olive oil loosens up the salad. if making the day before, save the herbs and add just before serving or toting to the BBQ. arugula, one of the easiest greens to grow in your garden is added to the mix. even if you don't have space for a garden try growing arugula in a large pot or window box - the seeds start sprouting within days and before long you will have a healthy little arugula patch ready for harvest. arugula is so versatile - top pizza, toss in salad or a substitute for lettuce a top a veg burger. 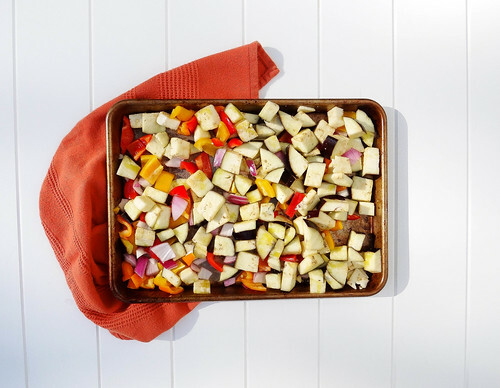 place the veggies on a sheet pan and drizzle with olive oil and toss lightly coating all sides of the veggies, sprinkle with salt. grill (grill set to heat of 400*), frequently tossing until veggies are golden and soft. 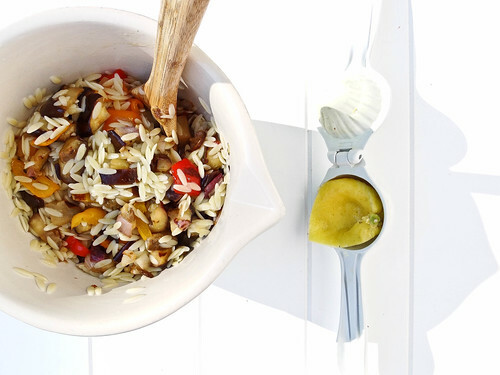 add the grilled veggies to the mixing bowl with the orzo. add the juice of 2 lemons to the mixing bowl and 1/4 cup of olive oil & salt - mix well. add the herbs & arugula, tearing the larger leaves into bite size pieces. drizzle with the remaining 1/2 lemon juice & sprinkle with a healthy pinch of salt just before serving. Looks yummy! 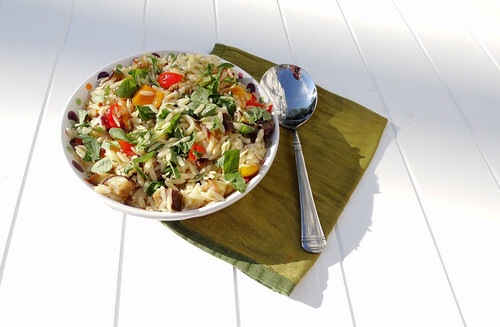 I made orzo salad this week too, and definitely have grilled veggies on the mind for 4th of July. I just checked out your recipe, looks so good too! Thanks Lauren, it was pretty tasty! I hope they do love it! 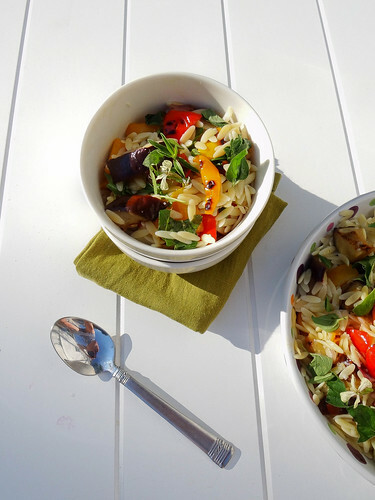 I love orzo for the fact it is not suoer heavy like alot of pastas can be - I much prefer the higher ratio of veggies to pasta :) Haha I used mini peppers, they are much smaller than their full grown versions, I didn't even see that- good eyes! Oh my, you certainly spoiled your dad! What a lucky guy! 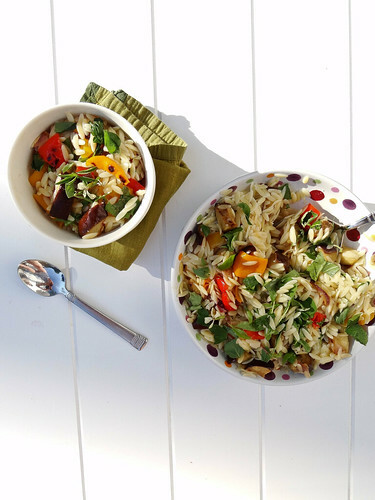 Pasta salads are so great when made ahead of time- magic happens when it's allowed to rest and meld together! They're especially good when you get the roasted, earthy flavours of veggies paired with bright tasting herbs and lemon! Happy 4th of July Heather :) Hope you have a wonderful day! Seriously, super magic! I love the lemon and herbs, it brightens up the whole dish! This looks fabulous! I love roasted vegetables! 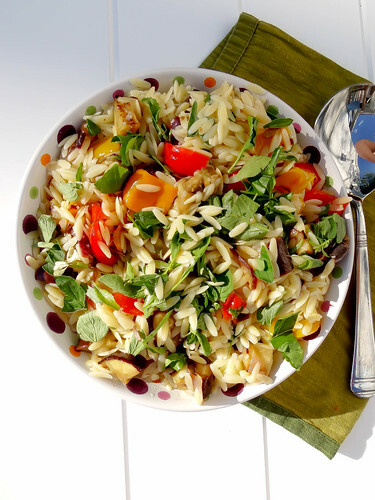 Great idea to toss them with orzo and turn it into a salad. YUM! :) I cannot wait to try this out! Hope you had a wonderful July 4th! HUGS! :) Did you enjoy the fireworks? Thanks Meliss! 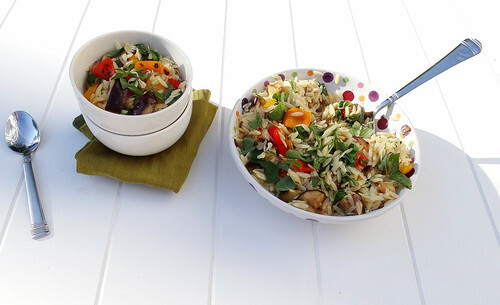 I love the color from the eggplant and peppers - so pretty with the fresh herbs too! Beautiful photography. Your pictures make me want to lean forward and sniff my screen. Haha certainly feel free to sniff away! Mmm, I just love roasted veggies. 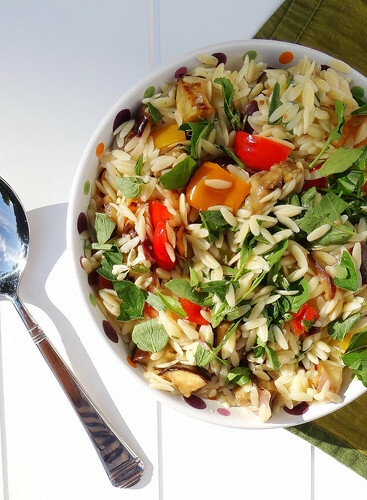 And come to think of it, I love orzo too! Something about small pasta like that is so fun! I love simply this is dressed, I'll have to try that! I agree with you 100% Heidi - little pastas are so much fun! Yum! What a refreshing salad! I love that your baking sheet looks just like mine ;) I can't get all the juicy carmelization off for the life of me! Wow, who knew so much nutrition could be packed into such a simple and beautiful dish? I love all the bright colors, too. You know something is good when it's this bright and welcoming! Thank you - for some odd reason the formatting was off!